Posted April 2nd, 2019 by pristine & filed under House Cleaning Services. If you are one of those people who do not find joy in cleaning, then you have probably put off the task of wiping dirty surfaces in the kitchen, and clearing the decks. We get it, deep cleans are agonizing, but that does not mean you should give in to the appeal of ignoring the mess in your kitchen. After all, deep cleans are essential for maintaining an aesthetically pleasing kitchen that is free from dirt and bacteria. You can go from messy to clean in 15 minutes by clearing out all clutter from the floor, cupboards, and counter-top. If there are any dirty dishes with hardened food residue, soak them in warm soapy water so that the food particles can dissolve into the water and require less scrubbing later on. A quick cleanup of the kitchen is an important step because it will give you more space for doing the actual deep cleaning projects later. Note: Do a quick tidy and don’t spend too much time organizing every little thing in the kitchen. For this first step, it’s better to focus on items that are obviously out of place so you can make the counters as clear as possible. Don’t underestimate the importance of this second step. Assembling your supplies decreases the risk of distractions and allows you to work more efficiently without having to look for sponges, cleansers, and dishcloths every time you need to clean a certain spot in the kitchen. If you don’t have a basic cleaning kit yet, consider using green cleaners to reduce the amount of cleaning products you need to buy every time your stash runs out. A weekly cleaning of the light fixtures in your kitchen can give new life to the room. Whether you have a chandelier, pendant, or recessed lighting, you need to keep it free from grime and dirt to ensure that the amount of light the kitchen receives is not reduced, you want the room to remain well illuminated. To dust light fixtures, you will need an extendable duster that can trap dirt and dust. A dry microfiber cloth also works well in removing debris from your light fixtures, so you might want to consider this if you don’t have an extendable duster. Fixtures with glass covers require a different cleaning method. Since we’re aiming for a deep clean, you will need to remove the glass from pendant lights or dome lights so you can get rid of dead bugs and dirt, and clean the inside with soapy water. If you are doing this chore alone, and are not sure whether you can firmly support the glass while removing the clamps from your light fixture, then it may be better to enlist the help of cleaners. They can take on the more challenging chores like cleaning chandeliers that have dangling crystals, so you can avoid damage on your light fixtures, and ensure that you will get the most out of your light bulbs’ lifespan. A regular cleaning of kitchen appliances is the key to preventing malfunctions, and increasing the lifespan of your appliances. The importance of clean kitchen appliances to your family’s health is another thing you can’t ignore. Remember that grease and food particles left uncleaned inside the oven act as bacteria carriers that can affect the health of your family, so it’s crucial to get rid of them to lower the chances of infections due to contaminated food. Unplug the appliance and empty the crumb tray. Remove the knobs and racks and place them in a warm, soapy water before scrubbing off any dried food particles from the racks. Clean the interior using a cloth that has been dipped in a mixture of dishwashing liquid and water. Burned-on food can be removed using a toothbrush. Remove all the contents of the fridge before starting, and store them in a cooler while you clean. Having an empty fridge will allow you to easily access the items you need to sort through. Throw out moldy food, and other items that you are unlikely to use in the future. You can remove drawers and shelving from the refrigerator and place them near the kitchen sink to get the job done quicker. This also allows you to do a more in-depth clean inside the fridge. Many kitchen appliances need regular cleaning to prevent a build-up of grease that could easily ignite a fire. So if you can’t commit to attend to the task regularly, simply schedule a weekly professional cleaning of the whole kitchen area so that professionals can detect any issues, and ensure that your kitchen appliances are still safe to use. To organize your kitchen cabinets, take out all items and place them on your kitchen counter where you can sort through them. Use airtight containers to store cooking and baking staples, and label them accordingly before putting them in your kitchen cabinet. Deep cleaning the kitchen is a chore that many of us try to avoid or delay because it takes too much time and effort. You have to sort through items from the fridge and cupboard, dust the light fixtures, clean inside appliances, and ensure that you don’t cause damage to any part of the kitchen. You also have to consider the type of tools and cleaning products that will get rid of dirt and harmful bacteria. Is it All Too Much Effort? At Pristine Home, we take care of deep cleaning your kitchen using the right tools and safe cleaning solutions that disinfect contaminants from your kitchen area. 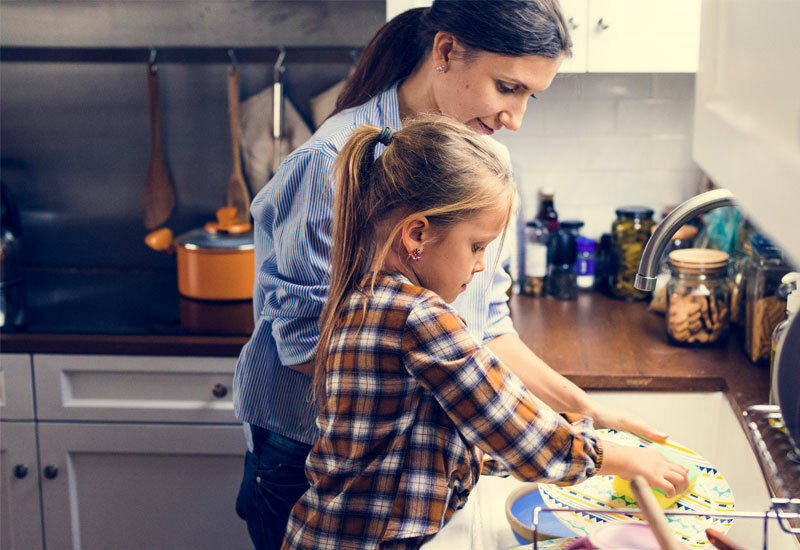 We can come for a weekly or bi-weekly cleaning appointment so you can maintain a dust-free kitchen that will serve as the perfect place for making memories with the family.